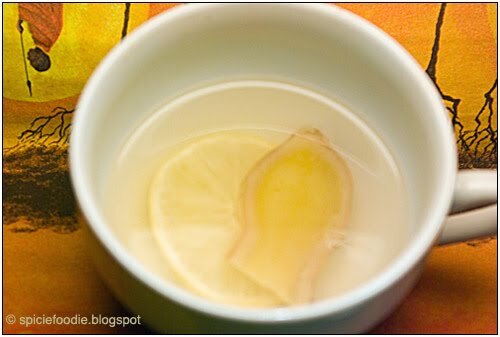 Ginger Tea with a squeeze of lemon juice and a dollop of honey. The cold almost winter weather that is upon many of us is the perfect time to warm up with a big cup of tea. 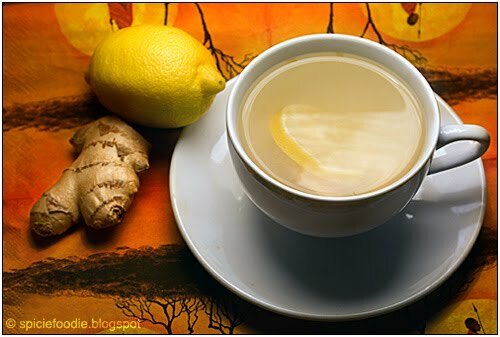 Ginger tea is also a great drink during the flu and cold season because of it’s benefits to the immune system. But first let’s break down the individual ingredients and the benefits they each bring to this warming and health boosting tea. In Asian cultures ginger has long been used for it’s healing benefits and it has caught the attention of many people in regions all over the world. Ginger is believed to help clear up the upper respiratory tract and so many people believe that this helps with the symptom of colds and flu. Ginger has also been used to treat nausea, circulation, inflammation, upset stomach, indigestion, arthritic pains, sore throats, the list of ginger benefits is quite long and I think it probably requires it’s on post. The next ingredient is lemon juice, lemons are loaded with Vitamin C which helps your immune system fight off infections. Lemons like ginger are used to treat upset stomachs and nausea. Lemons also have antiseptic properties that are both good for your skin and body. The last ingredient is honey, it doesn’t only taste good on it’s own or as a cooking ingredient, it’s also very good for you. Honey has long been used in homeopathy for the antibacterial and antiseptic properties it has. If you have ever tried honey or honey and a little lemon juice when you have a sore throat you can instantly feel it coating your throat and start to feel better. Honey is also used to help heal wounds, in many skin and cosmetic products. It has also been used in experiments for treating allergies and for it’s benefits with Diabetes patients. As you can see each ingredient in this healing tea brings a lot of health benefits making this a delicious and healthy drink to enjoy. 1. Slice the ginger root and don’t peel, only cut away any bruised areas. Add the water and the ginger to a pot and over medium heat bring to a boil. Boil until the water has turned a light brown color, this will take about 15-20 minutes. Next squeeze the lemon and add the juice to the tea. (* The amount of juice is up to you, or how lemony you want it to taste. I usually add the juice of 1 medium lemon. )* Mix the juice and tea and let it boil for another 3 minutes. 2. 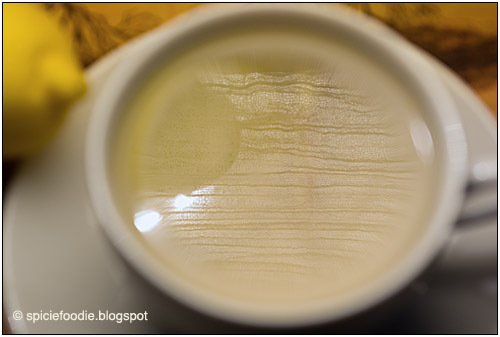 The honey can either be added to the tea in the pot or you can add it to a tea cup and pour in the ginger tea. The amount again is up to you and how sweet you want it. (I usually add a small dollop to my tea cup.) You can also strain the tea before you serve. An optional small serving suggestion is to add a thinly slice piece of lemon and ginger, or just serve warm and enjoy. Ginger tea for me is a comfort drink that I enjoy all year round, it makes me feel physically better and it enhances my senses and calms me all at the same time. I hope you try this tea and that you enjoy it as much as I do. *update* I also forgot to mention that this tea is great for women suffering from menstrual cramps. The tea helps relax the muscles and lessens cramping. But remember consult your Dr. before or make sure that you are not allergic to any of these ingredients. Oh wow, beautiful picture, and great idea for making your own tea! Winter everyone like to take hot drinks. I like your recipe. I will try.. I love this tea. Thanks for breaking down the health benefits. I think I kind of need it right now. They are comforting, warming and relaxing. Your pics are amazing. I can practically smell every ingredient. I love this tea it's perfect for combating those annoying colds. I drink this all the time. But it never looks that good! :) Lovely blog. I will have to add all my tea recipes to share with you guys. oh i am so making some tomorrow morning! i dont even like tea but because this tea contains no tea its the tea for me! can just imagine slurping that you know! gloves on scarf warapped! thought id pop by again lol! oh this tea just looks so soothing! This look so delicioso I can’t wait to try it!